An affordable homework desk for kids and teens like those here, are a good idea for providing a reliable place to study away from the bustle of life. Desks for studying are essential for kids' academic success, building valuable life-long, study habits that'll extend well beyond their homework years and on into their career realm. I know what you may be thinking; as a parent of three boys, I don't want to broach even my kid's college years, now--let alone a career! But it's these small investments we make now that help build a stable foundation for our student's formal years, where they'll be expected to really perform as adults. And starting now with a desk for kids to study just makes sense. After all, today's academia is quite aggressive and seemingly relentless with all the daily homework that's expected of them. 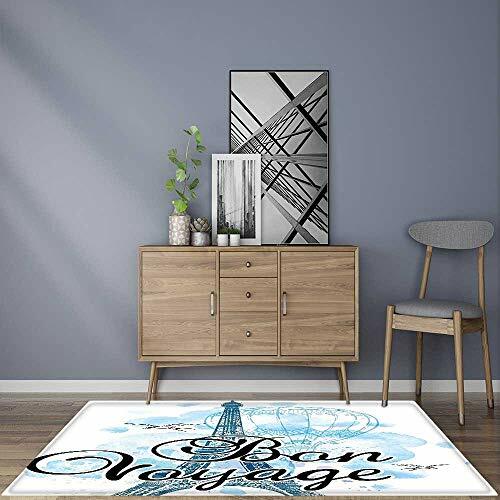 Not to worry; scroll down to do some studying of your own as you peruse the various desks for kids' rooms along with a few study and Decorating 101 tips for melding your kid's study desk into their room's decor, for the form and function you'll both love. With all the desk styles and considerations, finding the study/homework desk that's 'just right' is frustratingly akin to Goldilocks' conundrum. While the right student desk isn't a product of rocket science, you can make a misjudgement when sizing up your kid's available bedroom space with your new desk's size. 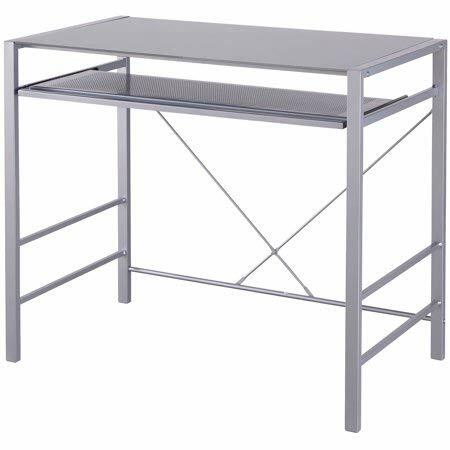 I suggest if you've a lightweight coffee or console table, using it as a model for a desk. This way, you'll have a good idea where and how you'll place your new desk furniture. I did just that when I wanted to look at kitchen work islands, and I was sure glad I did; my 'great' idea was way off! Here's a look at several cheap pink, purple and blue desk and chair sets of the same style for boys and girls that are decorative, budget-friendly and small enough for tight spaces.I appreciate having the pieces as a set versus having to shop for separate pieces. 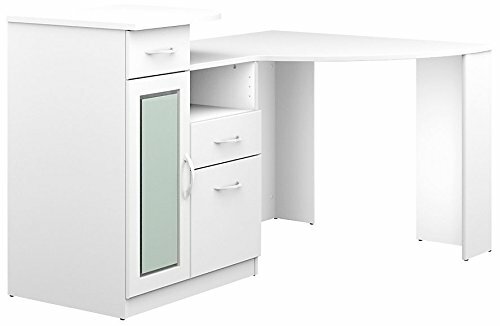 And another bonus: finding a space for these desks should be much easier, as I can see either of these lightweight, metal homework/study desks working in a closet--both walk-in or with accordion-type door varieties. Don't discount unconventional spaces for your kid's desk placement; if it works for your student, so be it. The frame is rather lightweight, it's true but when kids get up there in complexity with studying physics and chemistry, they'll need to trade up to more substantial pieces, like those below anyway. 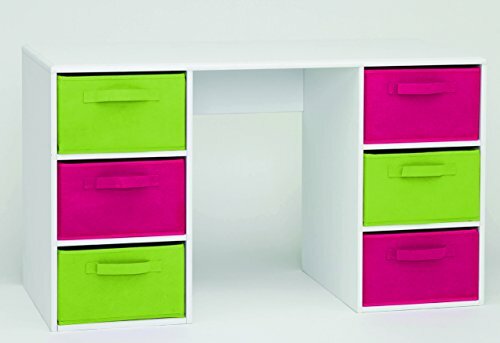 Are you looking for fun color desks? 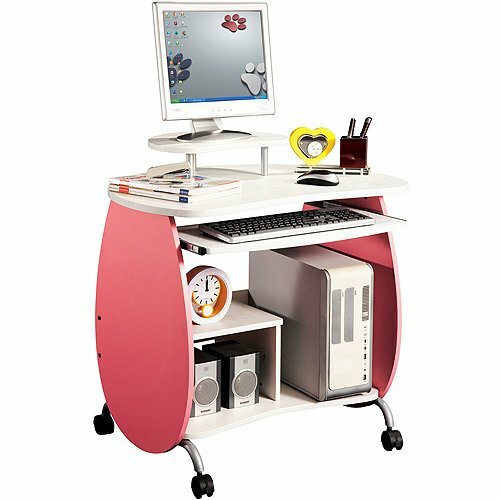 You might opt for a corner student desk like this one if this arrangement from the rectangular style doesn't work in your kid's bedroom space. 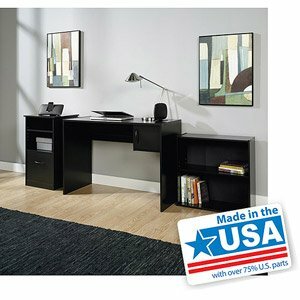 I've included some corner desk ideas that are ideal for homework and studying. Start with your desk's placement and the rest of your kid' study zone will fall into place. Easy-Peasy! Student desks that fit your kid's bedroom space need to fit your budget, too. 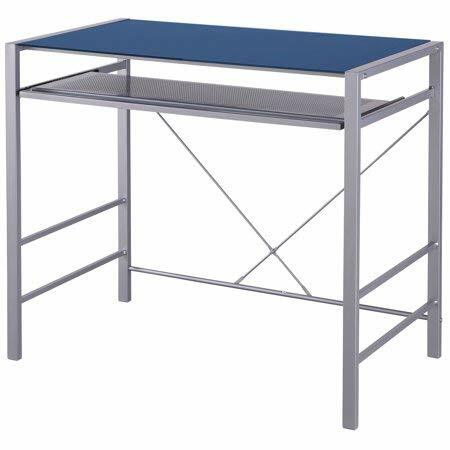 Homework and study desks like these heavyweights are remarkably durable with their medium density fiberboard (MDF) construct. 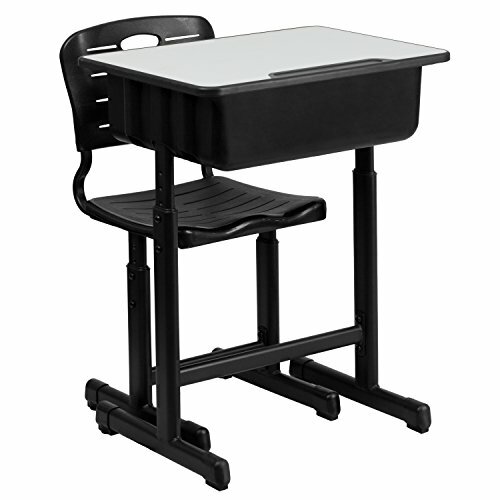 The desks are ideal for homework and longer study sessions but save you money to boot. My kids' first desks were made of MDF and as tough as they were on furniture in general, those small desks held up fabulously and the desktop surfaces cleaned up nicely--a definite plus-plus. And since I had to buy two desks at one time, it was nice not to have such a big expense. 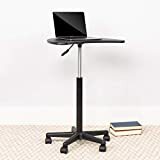 Here's proof-positive that you can find great options when searching for kids' study desks without sacrificing too much in the way of form and function. 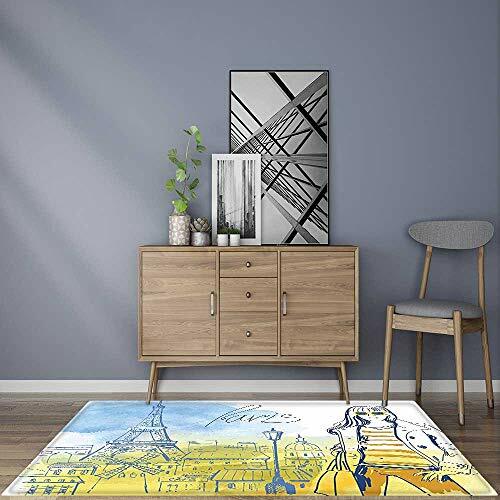 If you happen upon a desk you and your child loves but the price is just too steep, it's a good idea to make note of the desk's features and look for a mirror image in an MDF student-type desk, like those shown, here for well under $100 and minimal--or no--shipping. I've been pleasantly surprised using this technique and I'm guessing you'll have the same luck with a little bit of looking. 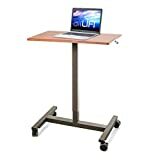 Aren't these under $50 to under $100 student desks great with all the extra storage they afford? 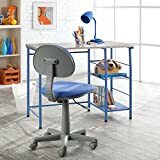 For younger kids needing a place for homework but still want a desk that's an attractive part of her or his bedroom, this classic design desk is ideal. The colorful drawer fronts conceal the clutter of paper and every other school supply your kid might have. The surface wipes clean and the desktop proffers plenty of surface area for getting the job done. As kids get older and more involved with complex mathematical operations and writing longer papers, their storage needs change. I remember my boys' firsts desks; they were small and simple but that compact solution that suited their elementary days, paled in comparison to the desks of their high school years. Older students need a place to put half-finished term paper drafts, notes they've printed out, software and other reference materials, lest they get lost in a sea of dirty laundry. I'm serious, here--we've 'been there and done that' with one too many papers. 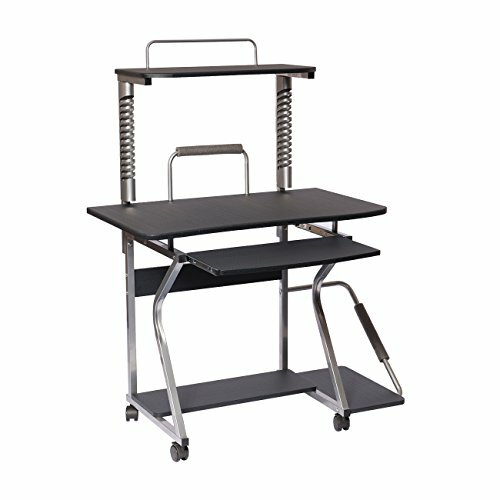 For the more studious kids, metal computer desks like these boast the extra storage they'll need while providing space-saving, keyboard trays and/or CPU storage. Desks are only the beginning of a well-appointed study zone (that's a kid-friendly term I made up; it sounds cool--I think!). You'll need to have a place for storing school supplies, files for important papers, a memo board and any other accoutrements your student needs. You won't need a ton of room, contrary to that list I just prattled off, above; you just need a little wall space above your kid's desk. I have a nice visual below that's worked for me and my boys in their small bedrooms. 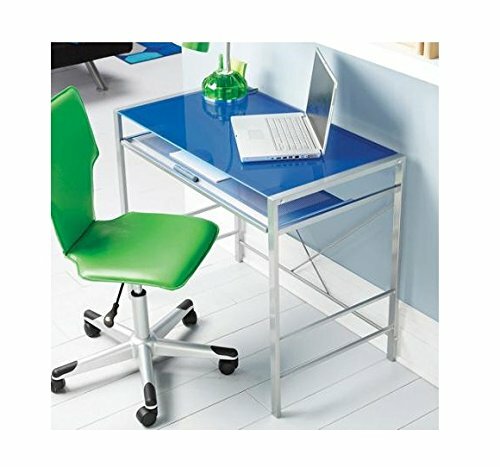 The glass and metal desks shown here have that cool look both boy and girl teens love. 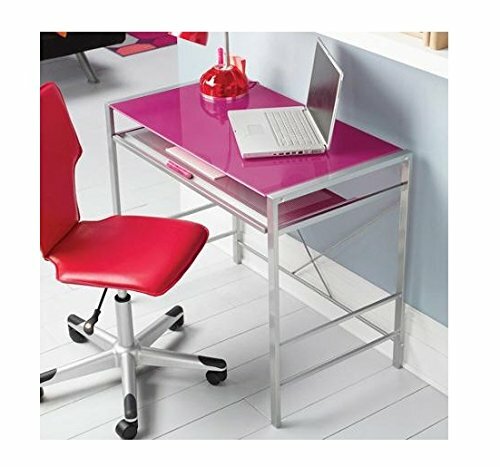 Pair these small pink and blue desks up with a funky chair and you've an uber-cool arrangement that's space-saving and useful--especially for laptop computer setups. 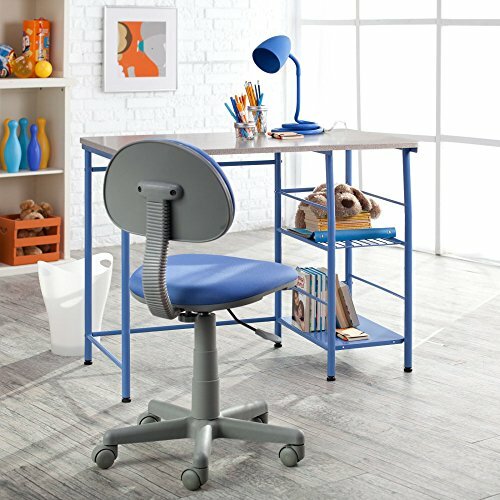 I've a nice (I hope,anyway) article listed at right about teens' computer desk chairs you may find useful. Check out the study zone visual I created below (at the end of this article) for money-saving storage ideas. Here's one instance where sending to and seeing your kid in the corner is a good thing! 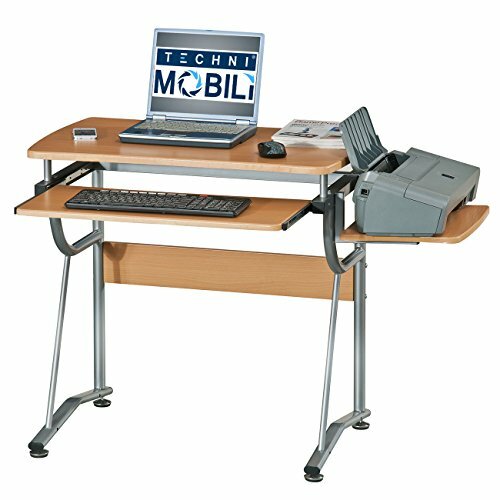 I love this corner computer desk with its slide-out keyboard tray, CPU storage, file drawer and room galore for students stretching out during long study and homework sessions. 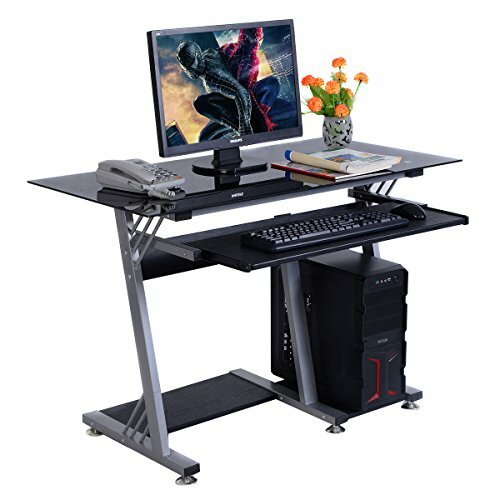 Where space is really limited, going to the corner may be your best bet for fitting your boy or girl's computer desk into the space without it looking like an invading UFO coming in for a landing. Corners also allow you to double your wall storage. Too, I love corners for their unique options for decorating or adding shelves. Or, add shelving on one corner wall and your memo board on the other. Save space on shelving by opting out of placing a lamp on it. Hang paper lanterns with a hanging light kit for fabulous study and homework lighting. 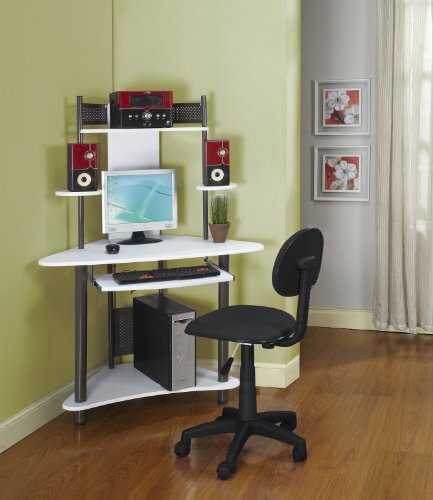 This wood corner desk with white, black and other popular finishes promise to give your kid a desktop they'll appreciate for years to come.With it amazing storage capacity and a place for everything, this computer desk seemingly has it all! 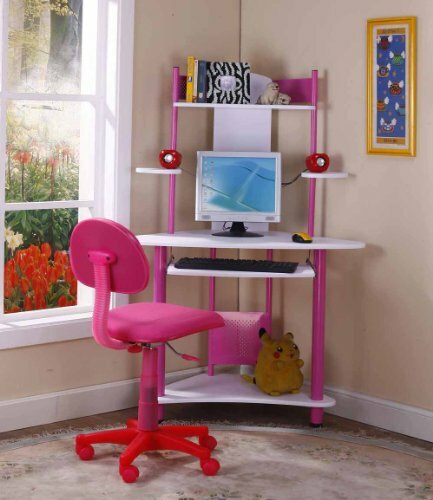 Much like the computer desk above, these playful, compact versions are more decorative with their fun pink and blue style. Indeed, desks can meld well with your kid's decor and other furniture pieces. Kids' bedrooms are most often small, so you'll have to be crafty, going up with storage while being careful to make your efforts attractive. I've included a visual and some helpful tips for creating more storage in a study zone within a small area or corner. Determine your child's study and homework habits and let your answers be your guide for how much area you'll need to dedicate to your student's homework area. What Kind of Homework Desk are You Looking For? My Einstein needs storage, storage and more storage! As I've mentioned, going up with your storage needs is your best bet in small spaces. 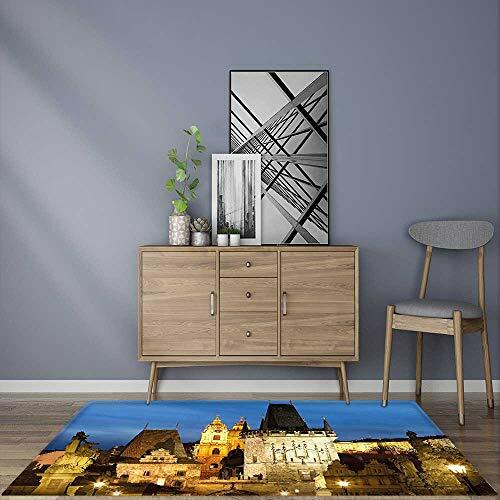 This image illustrates how well even the smallest of spaces can work in providing ample space for your child or teen's study needs. Simple shelving can accommodate several boxes with lids. I've found that photo boxes are both highly decorative and can be had (on sale) for $2 at big box craft stores. Too, photo boxes have a label holder, so you can identify what's inside. A trash can is a must-have with kids and can be a simple, colorful crate; it needn't be expensive. I've even used a metal paint bucket. A dry erase memo or cork bulletin board is another great addition and will serve your student well for test and quiz reminders. You can make the cork board kid or teen-friendly by inserting colorful wrapping paper over the cork surface. Add touches of color wherever you can to make your kid's study area a place they want to be. 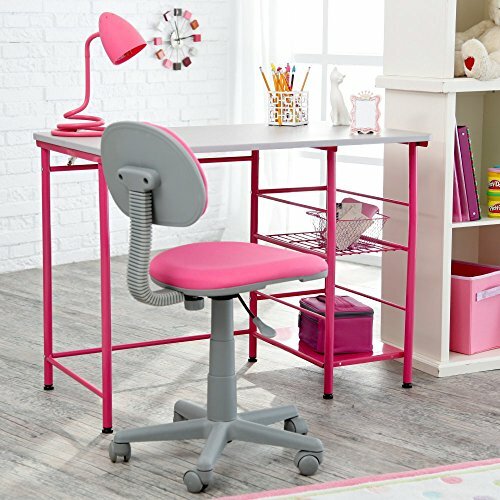 Share Your Ideas for Student Study & Homework Desks - is Your Kid's Desk in Your Girl's or Boy's Room? Art desks and tables with storage like these, have plenty of supply nooks, drawers and shelves for all those lines, and rainbows of color that somehow come together as art. Metal loft beds with desks underneath like these meld form with function for smarter use of space to sleep and do homework in your kid's or teen's bedroom.